In 2006, Grand Rapids Symphony violinist Diane McElfish Helle’s father found himself in a neuro-intensive care unit in Pittsburgh. The Grand Rapids Symphony musician, naturally, went to visit him with violin in hand, hoping to cheer him up with music. Diane McElfish Helle soon realized she was doing much more. When she started playing, the nurses opened the glass door so they could hear the music, too. Soon people started coming from all across the hospital floor, asking if she would come and play for their loved ones, too. That was some of the inspiration that led the Grand Rapids Symphony to launch its Music for Health Initiative, a program that sends symphony musicians into area hospitals, armed with the healing power of music. On Wednesday, June 7, McElfish Helle will be honored with the prestigious Ford Musician Award for Excellence in Community Service by the League of American Orchestras. She’s one of five professional orchestral musicians being honored at the League’s 72nd annual National Conference, which happens to be in Detroit this year. The winners of the Ford Musician Award for Excellence in Community Service were selected by a panel of peer professionals to receive the awards, which include a $2,500 grant to each musician as well as an additional $2,500 grant to the musician’s home orchestra to support professional development that’s focused on community service and engagement. Music for Health Initiative is a program that sends symphony musicians into area hospitals to assist with patient rehabilitation as well as to create supportive physical, emotional and spiritual experiences for patients as well as for the friends, families and providers who care for them. With funding from the Perrigo Company Charitable Foundation, Music for Health was launched in 2013 by a group of six GRS musicians, led by McElfish Helle, at Spectrum Health in Grand Rapids. The groundwork for Music for Health, part of the Grand Rapids Symphony's Gateway to Music, was launched in 2012 when McElfish Helle met with a music therapist and the program director Spectrum Health Neuro-Rehab to explore how the Grand Rapids Symphony might contribute to their work with patients recovering from traumatic brain injury. “We asked, ‘If you could have symphony musicians come and do anything, what would you have us do?’ she recalled. 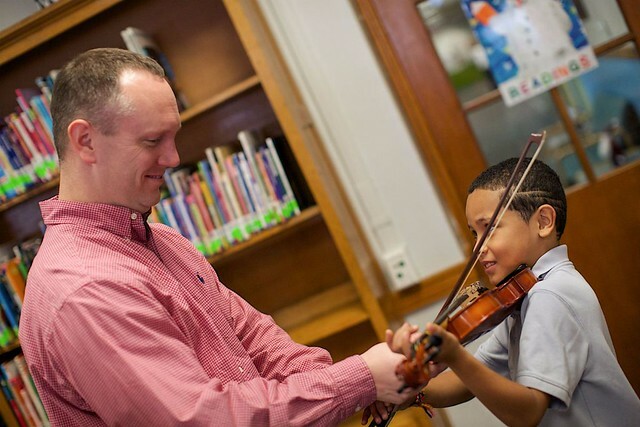 Out of this grew the Grand Rapids Symphony’s Music for Health partnership, which has pairs of musicians playing group music therapy sessions every month, sessions designed around patient needs whether they are e physical, emotional or mental. “By the end of our second year, we had 10 musicians doing 50 sessions a year and had branched out to also working with cancer patients during their chemotherapy infusion treatments,” she said. In 2015, the Grand Rapids Symphony was a selected by the League of American Orchestras to receive a Getty Education and Community Investment Grant, allowing the orchestra to expand its programs to the Spectrum Health’s Lemmen-Holton Cancer Pavilion. The Getty Grant provided funds to adapt music or commission new music for use for in Music for Health therapy sessions. Grand Rapids Symphony’s Assistant Principal Cellist Jeremy Crosmer, who also is part of the Music for Health team, was the composer. “We’ve found when we play these at the cancer center in particular, the nursing staff, as well as the patients, tell us that they feel the calming influence,” McElfish Helle said. Recently, musicians recorded four hours’ worth of meditative music that is broadcast continually on a dedicated TV channel at Helen DeVos Children’s Hospital plus four other Spectrum Health hospitals. Paired with photographs of outdoor Michigan scenes taken by Spectrum employees, the channel was launched in March 2017. Patients and visitors now are able to tune in anytime they wish, day or night. Music can be used actively for guided meditations, such as for pain management. Or it simply can be used for background. “We get stories every week from the music therapists about how patients are using this to help them sleep or to relax them when they are anxious,” McElfish Helle said. Naturally, professional musicians especially enjoy making music in the concert hall.